One of the strongest selections of the 2009 Tribeca Film Festival, “About Elly” is a psychologically penetrating film in which a woman’s disappearance gives rise to all sorts of complex issues of morality (both within an Iranian context and without), and questions of culpability and responsibility for tragedy. The film subtly switches from an observational and lightly comic portrait of Iranian middle-class life to a much darker morality play, and astutely demonstrates how both of these modes can be two sides of the same coin. The story begins innocently enough: A group of university friends from Tehran goes on vacation at a beach house near the Caspian Sea. Shy kindergarten teacher and stranger to the group Elly (Taraneh Alidousti) is reluctantly dragged on the trip by her friend Sepideh (Golshifteh Farahani), whose child is in Elly’s class. Sepideh’s hidden agenda in bringing Elly on this trip is to set her up with Ahmad (Shahab Hosseini), a divorcee visiting Iran and looking for a new wife. Elly resists for reasons that are revealed only much later. However, after Elly disappears, the deceits and personal agendas of the vacationers come to the surface. Farhadi proves adept at controlling the tone of his film. By slowly setting up the situation and the complex nexus of relationships between the characters, he lulls the audience into thinking the film will continue in a comic mode until Elly’s disappearance. From then on, the film takes a serious tone. Lies – casual and serious, necessary and unnecessary – come back to haunt the characters, and the consequences of these are unforgiving. Some of these lies were told due to particular proprieties necessary within Iranian society. For example, the group introduces Ahmad and Elly as newlyweds to the old woman who rents them the beach house. Other deceptions are, in many cases, serious breaches of ethics committed in an attempt to save face or avoid problems with the police. The brilliance of Farhadi’s script and direction (his efforts earned him the Silver Bear for best director at this year’s Berlin Film Festival) becomes most apparent in the latter stages of the film. As one secret after another is revealed, Farhadi deftly maps out the shifts in the perceptions and behavior of the characters toward each other as well as the viewer’s perception of the characters. Farhadi’s cast is uniformly excellent, especially Farahani, who compellingly registers Sepideh’s shock at how her seemingly innocent matchmaking has taken such a tragic turn, as well as the way her character, like others in the film, is revealed to not be what it initially appears. 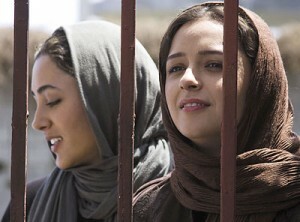 “About Elly” screens on April 27, April 29 and May 2 at the Tribeca Film Festival.